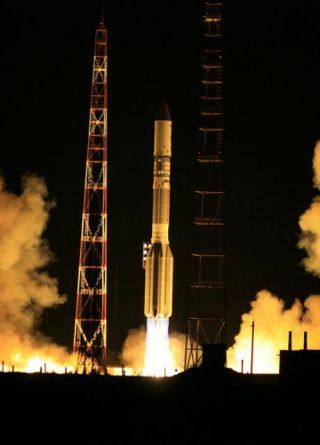 An International Launch Services Proton rocket launches the SES-5 telecommunications satellite. FARNBOROUGH, England – An International Launch Services (ILS) Proton rocket on July 10 successfully placed the SES-5 telecommunications satellite, equipped with a European government navigation terminal as a piggyback payload, into geostationary transfer orbit, ILS and satellite owner SES said. The launch, from Russia’s Baikonur Cosmodrome in Kazakhstan, was the fourth of a planned 10 commercial launches this year by Reston, Va.-based ILS. Built by Space Systems/Loral (SS/L), the 6,007-kilogram SES-5 was reported healthy in orbit, with its solar panels deployed, a development that carried slightly more than the usual amount of tension because of problems on a similar SS/L-built satellite launched May 31 aboard a rocket operated by Sea Launch AG. That satellite, the Intelsat 19, eventually deployed the stuck solar array but has suffered a permanent partial loss of power because of damage the array suffered for reasons that are still under investigation by SS/L and Sea Launch. The SES-5 launch had been delayed for about a month for reasons relating to the Proton rocket and not the satellite. SES-5 is Luxembourg-based SES’s 51st satellite. The company is undergoing a substantial fleet-expansion program, targeting mainly those markets in South America, Africa, South Asia and the Middle East whose demand for satellite bandwidth is growing faster than the mature markets in North America and Western Europe. SES-5, which will operate from 5 degrees east in geostationary orbit, carries 36 Ku-band transponders and up to 24 transponders in C-band for direct-to-home television, cellular backhaul and maritime communications in Europe, Africa and the Middle East. It features two Ku-band beams, one targeting the Nordic and Baltic regions, the other trained on sub-Saharan Africa. Egnos will also provide signal verification for Europe’s Galileo navigation satellite system, which like the U.S. GPS is a constellation of satellites in medium-Earth orbit. SES and the commission signed two contracts for Egnos services in 2009 and 2010. The first is for SES-5 and is expected to last for the satellite’s full 15-year life. The second satellite covers an Egnos terminal to be placed on the Astra 5B spacecraft, to be operated from 31.5 degrees east following its launch in mid-2013. The commission is paying SES 9 million euros ($11.25 million) per year, per satellite, for the service, giving the Egnos contract a value of at least 270 million euros for SES, assuming the satellites are retired after 15 years.